Is It Time to Treat My Acne Scars? This is a very personal question. Acne is everywhere. If you have skin, then you’ve experienced acne in one way, shape or form at some point in your life. If you’re reading this page, chances are you’ve really suffered with your acne. As if dealing with acne outbreaks wasn’t hard enough, you may now be left with the prospect of staring at the scars that your acne has left behind everyday as you look in the mirror. At Celibre Medical, we understand how difficult acne scarring can be. While some people are not bothered at all by the most severe scars, others just plain hate looking at even the slightest remnant left behind by this frustrating problem. Maybe you’re acne is finally better, and you feel you’ve suffered enough. You’re ready to leave the past behind and want to feel confident in the way your face looks again. Choosing to move forward with treating your acne scars is a tough decision, but it can be well worth it in the end. Just as no one, acne treatment works for all acne 100% of the time, no one treatment targets all acne scars. And just like the acne beforehand, the scars can take on all colors, shapes and sizes and very in severity from person to person. We understand this. We know that the treatment of acne scars is a very individualized, custom process that needs to be tailored to the needs and budget of each patient we see. Fortunately for you, we are experts at doing this! Why Does Acne Leave Scars in the First Place? It’s a complicated question that doesn’t have a real clear-cut answer, but it’s an important one. Not all acne scars. We do know that people with certain skin types or racial backgrounds tend to get more pigmented scars, and we also know that the more severe forms of acne like the nodules and cysts are much more likely to cause scarring then a blackhead or whitehead. But no one, as of yet, as really figured out why acne leaves such a wide array of scarring behind in different people. Textured acne scars can either be raised and bumpy or sunken in and indented. Because people’s skin heals in very different ways, it’s really difficult to predict the type of scarring you are most prone to have. A raised scar is due to the build up of hard, dense scar tissue in response to the inflammation of the acne. In essence, the body has “over-healed” itself in response to the trauma caused by the acne. Conversely, an indented, sunken in scar is often referred to as an atrophic scar. These scars usually form when an area of the skin is repeatedly affected over and over again by acne. The constant inflammation causes a breakdown of the collagen and elastin in the skin, which is what gives it its firmness. The skin becomes thin and depressed in the areas and the scar will be irregularly shaped. Most people have a combination of the two types of textured scarring, and while these are broadly discussed here, we will go into a bit more detail below, as there are many different types of textured acne scars. Colored Acne Scars are usually referred to as pigmented scars. They are usually either brown (dark) or red. People who have really fair skin tend to have a red colored scarring that’s left behind after the inflammation of acne. This is usually due to excessive blood vessels in the skin formed in the healing process. Darker skinned people or Caucasians who tan easily may have brown or dark acne scarring. This type of scar happens when the pigment cells (melanocytes) in the skin become overly active in the healing phase of acne. Both textured and colored scars can be equally devastating to someone who has them. Often, they can’t be covered with makeup and are very noticeable in photos. Many people feel that the scars left behind are worse than the acne that caused them in the first place. While acne eventually goes away, the scars are left there forever. While this is not an exhaustive list of all of the types of acne scars, it covers all of the major ones that you may hear about. We want you to be comfortable with the terms so that you’ll understand them and can take an active part in creating your specific treatment plan. It’s vital for you to understand the goals of your treatment, and you can’t really do that if you don’t understand what’s being treated in the first place! Atrophic Acne Scars: These scars are usually small–less than a centimeter–and they are more common in Caucasians. They are soft and indented scars that may be reddish or purple in color. Because the skin is atrophied or thin, the blood vessels just below the surface are commonly seen which is why they appear colored. Depressed (Atrophic) Fibrotic Acne Scars: These scars are usually a bit larger than the atrophic ones. They have well defined edges that appear sharper and are steeper. These scars have hardened, fibrotic tissue binding them down just beneath the skin’s surface. Pigmented Acne Scars: These scars usually have a red or brown color associated with them. 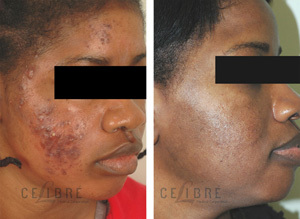 During the healing process, lighter skinned people may develop red scars and those with darker skin may be left with brown or dark colored scars. Boxcar Acne Scars: These types of scars closely resemble a chicken pox scar. They are usually round or oval in shape, are depressed and have steep, angled edges. These scars usually form when an acne lesion severely damages the underlying tissue, which creates a more sunken appearance with this type of scar. Ice Pick Acne Scars: These scars are very small but deep. The opening can vary from a pinpoint to about 1/8th of an inch. The scar tissue often extends far down into the dermis (the second layer of skin). Superfical & Deep, Soft Acne Scars: These scars are different from the atrophic, atrophic fibrotic and ice pick scars. Unlike those, there is no hardened, fibrotic tissue associated with them and no sharp edges or deep penetration. These scars are soft to the touch; they are usually round and have rolling edges. Keloid (hypertrophic) Acne Scars: These types of scars more commonly occur in Asian and African Americans. They can be very large and the dense, and the scar tissue will often extend way beyond the boundaries of the original acne lesion they stem from. No one knows exactly why keloids happen, but people who get them tend to produce way too much collagen and fibrous tissue in the healing response. So you can see that the treatment of acne scars is a pretty complex and intricate process. There are many types of scars, so you need to have a pretty good-sized tool chest to pull from to get the job done. We want you to know that we have a wide range of treatments available to help address any and all of your acne scar concerns. There is no one treatment that works best for everyone, but there are treatments that work. There is hope! Maybe you’ve considered this treatment for a while, and now you are taking a very important first step by educating yourself on the treatment of acne scarring. We are here to help you through that process. We would love the opportunity to sit down face to face and talk about the different ways we can help you not only look better, but feel better about the way you look. We are your partners in this journey and we hope we get to meet you soon! Give us a call today!